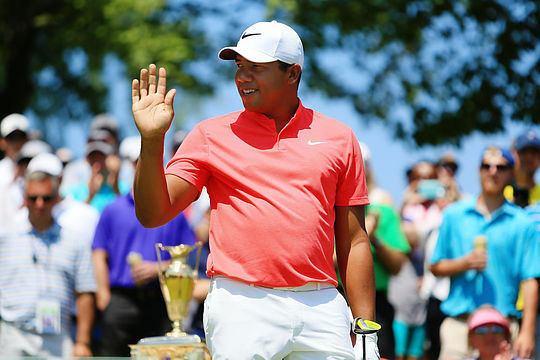 Jhonattan Vegas has won his second consecutive Canadian Open title in a sudden-death playoff against American Charley Hoffman at Glen Abbey golf course. Vegas, a Texas Longhorns graduate, became the first player to successfully defend the Canadian title in 10 years after firing a stellar 7-under-par 65 to finish equal with Hoffman at 21-under in regulation. Vegas then secured the title with a birdie on the first hole of sudden-death, the par-5 18th. Vegas had missed the cut in each of his last five starts and seven of his last nine coming into this championship. Vegas now has three PGA Tour titles to his credit after also winning the 2011 Bob Hope Classic. He’s the sixth player to win consecutive Canadian Opens, following J. Douglas Edwards (1919-20), Leo Diegel (1924-25), Sam Snead (1940-41), Jim Ferrier (1950-51) and Jim Furyk (2006-07). Hoffman was forced to face another close finish having been in the mix for the third time in his last five starts. England’s Ian Poulter finished a stroke short from making the playoff after carding an impressive closing round 64. The result is just the latest in a string of impressive finishes for Poulter, including a second at The Players Championship and he hasn’t finished worse than T-45 in eight starts since, including a T14 finish at The Open. These results keeps Poulter’s chances of retaining a PGA Tour card for 2018 even more alive. Australian teenager Ryan Ruffels fired a closing round that he would rather forget ending his chances of a top-10 finish with a 76. After beginning the final day three shots off the pace, the 19-year-old Victorian finished in a tie for 32nd at 10-under after dropping eight shots in 14 holes but rallied with an eagle and two birdies in his closing three holes. Ruffels was the leading Australian, with Cameron Percy at 3-under sharing 70th and Brett Drewitt at 1-over alone in last place.